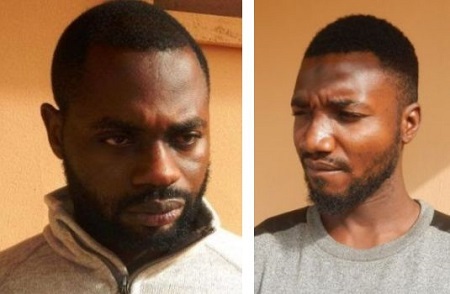 The Ibadan Zonal Office of the Economic and Financial Crimes Commission, EFCC, has arraigned two suspected Internet fraudsters, aka Yahoo Boys Abdulwahab Abduljelil and Erinle Olalekan before Justice Maliki of the Federal High Court sitting in Ibadan, Oyo State. They were nabbed at the operation base for offences bordering on possession of documents containing false pretence, as well as obtaining under false pretense and forgery. After listening to the charges against them, the judge adjourned till 26th of October, 2017 for ruling on their bail applications and 30th of November for commencement of trial. The court also ordered that the defendants be remanded in Prison pending the ruling on their bail.